Some people have a single sweet tooth while others have an entire mouth full of them. For Sue Zuck and her family, the latter category applies, and their devotion to chocolate – and Lakewood – knows few bounds. 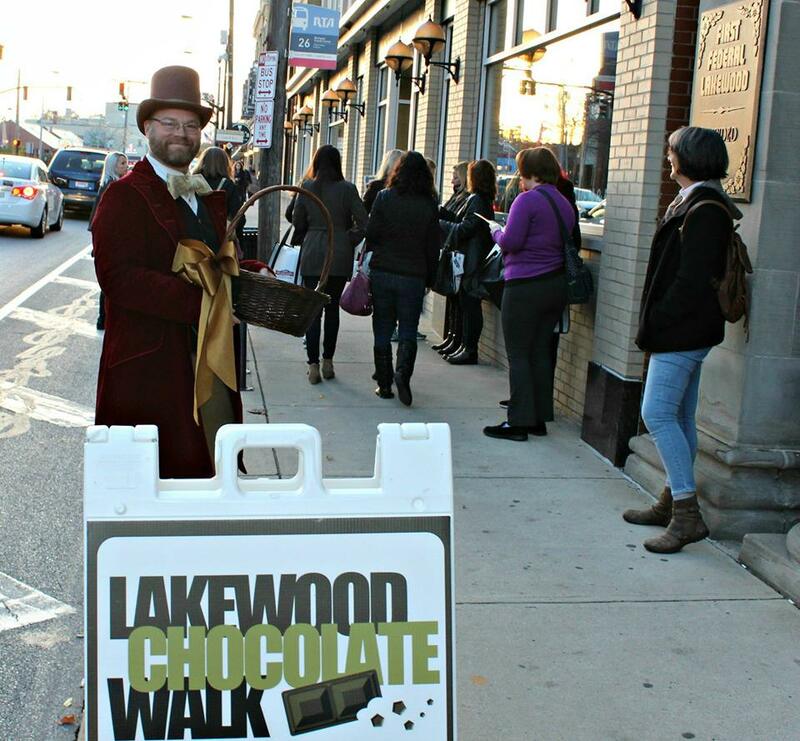 The Lakewood Chocolate Walk is a popular autumn tradition. The Erie, Pennsylvania residents traveled four hours from their home and back in one day to attend the 2017 Lakewood Chocolate Walk in Downtown Lakewood. They weren’t alone in crossing state lines in the name of chocolate, as another group of attendees ventured from Detroit, Michigan to partake in the festivities along Detroit Avenue. In total, a sellout crowd of 300 attendees from across Northeast Ohio and beyond participated in the 9th Annual Lakewood Chocolate Walk on Thursday evening, October 26. This large contingent of chocoholics descended upon Downtown Lakewood to visit more than 25 merchants serving as “Sweet Stops” by each offering guests a unique chocolate treat. Hosted by LakewoodAlive and the Downtown Lakewood Business Alliance (DLBA), the Chocolate Walk has developed into a highly-anticipated Lakewood tradition. Tickets went on sale during the morning of October 2 and sold out within a matter of minutes. Zuck stayed up following an overnight shift at work to secure her tickets online. Having participated in the Chocolate Walk several years ago, she was aware of the chocolate-induced fun associated with this popular Lakewood autumn tradition. But would she make the trek again next year? KB Confections provided a perfect setting for the Pre-Walk VIP Reception. 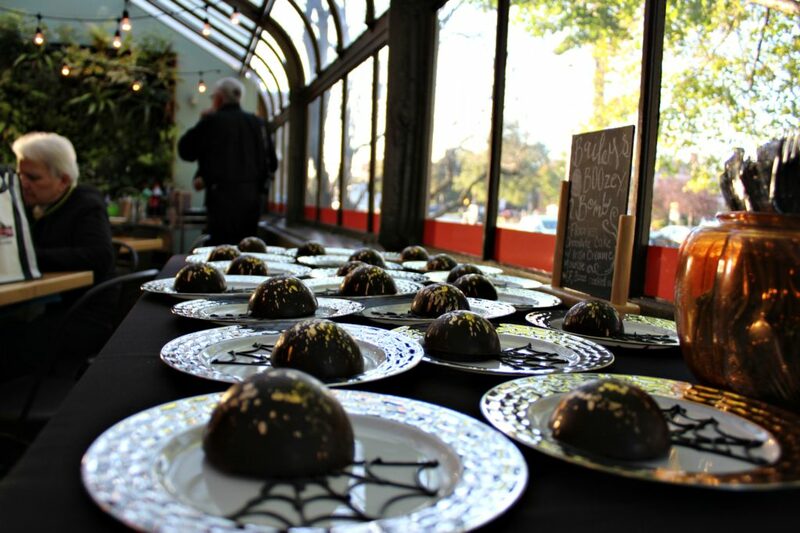 The evening kicked off with the Pre-Walk VIP Reception at KB Confections, where 50 lucky guests enjoyed chocolatey concoctions and libations within the bakery’s greenhouse cafe. Aladdin’s Eatery and Upper Crust Lakewood furnished savory foods for the VIP guests, who rode aboard the “Chocolate Express” to and from Downtown Lakewood. “Welcome to the Lakewood Chocolate Walk, here’s a chocolate appetizer!” stated “Charlie Chonka” – played by volunteer J.P. Ptacek – in greeting guests who arrived at First Federal Lakewood to commence the walk. Attendees were given a map of Sweet Stops and ventured out to delight their taste buds by visiting participating merchants. In addition to being rewarded with delectable treats, attendees sought to find 12 hidden golden eggs. 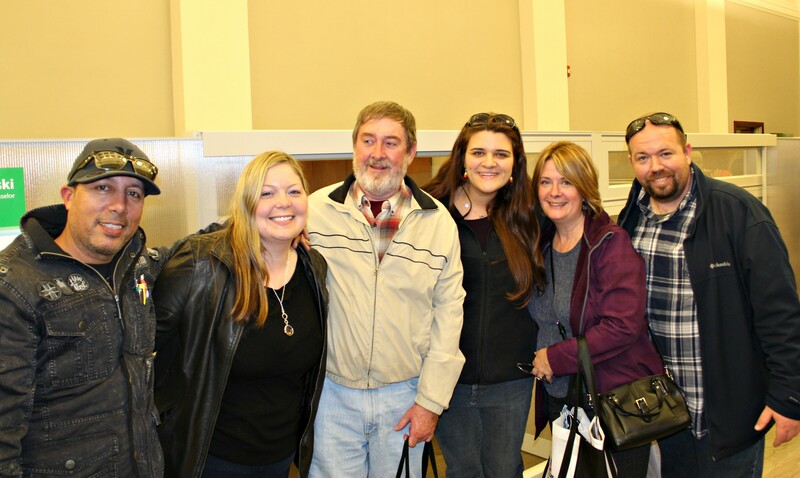 Sue Zuck (second from right) and her group traveled from Erie, Pennsylvania to attend the 2017 Chocolate Walk. The evening concluded with the Final Stop at First Federal Lakewood. Here attendees were able to wet their whistles and enjoy a final round of sweets thanks to Insomnia Cookies and Trikeable Treats. The Final Stop provided the setting for naming winners of raffle baskets, the Golden Egg Hunt and the silent auction, for which one lucky attendee earned a Gathering’s dinner for six valued at $800, courtesy of Roundstone Insurance. LakewoodAlive and the DLBA thank the following merchants for their participation in the 9th Annual Lakewood Chocolate Walk: Addicted Coffee & Ice Cream, Aladdin’s Eatery, Barton Senior Center, Burgers 2 Beer, Campbell’s Sweets, Cotton Lakewood with Sweet Amelia’s, Discount Drug Mart, Dramatics Hair Salon with Ice Cream Joy, Edible Arrangements, First Federal Lakewood, Fred and Daisy’s, Geiger’s, Gianna Jewelers, Home for the Holidays Pop-Up Shop, KB Confections, Lakewood Baptist Church, lion and blue, Melt Bar & Grilled, Norris Chiropractic with Fear’s Confections, Paisley Monkey with Indigo Perfumery, Plantation Home, Rozi’s Wine House, SouperMarket, Tease Hair + Body Parlor, The Tea Lab, Trikeable Treats with Elmwood Bakery, Upper Crust Lakewood and Voodoo Tuna.